The Designer of this Acoustic Lounge Seating series created it to form smaller spaces within an environment. For individuals, this acoustic seating design creates a place for people to escape, think, and breathe. For groups, it creates a place for people to closely collaborate and connect. 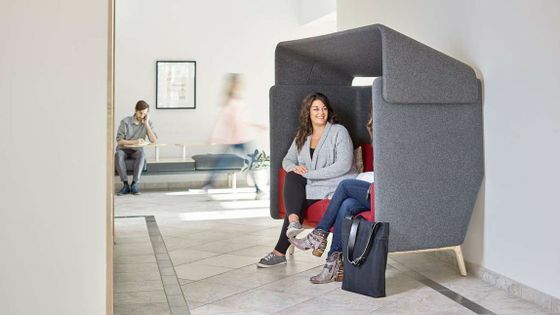 This design’s comfort and visual softness allow these small rooms to blend seamlessly into the office, while still providing the closeness and privacy people need to really focus. Each detail of the design works together to create a pocket of people to gather or spend time alone, from its rounded corners to the precise thickness of the sound-dampening felt. This acoustic furniture series comes in different configurations with options for tables, lights, and screen mounts, metal or wooden legs and numerous available fabrics. Our project consultants can assist you in creating a layout configuration to fit your space.